Fair warning: My wife Erica‘s debut novel was just published and is currently available for Amazon Kindle and Kindle Apps on iPad and Android Tablets. It’s called “The Truth About Suzie“. It’s a very good novel. 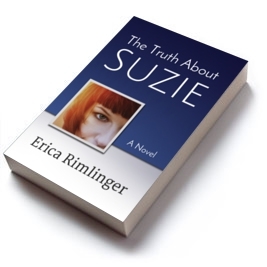 You can find it here: http://TheTruthAboutSuzie.com. 3. Review/rate the book on Amazon. 4. Tell all of your closest friends and strangers about the book. In a few weeks, the print version will be available and I will do the same thing all over again. Many of you will do these things out of sheer devotion to me. I thank you for that, but let me assure you that’s not why you’ll want to do them. You will want to do them because it is a superbly entertaining book. I promise that all who read it will laugh, most will cry, and those that are super tough will succumb to a mysterious affliction that causes a tightened throat and watery eyes, or maybe it’s dust… yeah dust, that’s the ticket. In any case, you’ll love the book because the plot is compelling, the writing fantastic, the storytelling inventive, and the characters are so rich and interesting you will miss them when the story ends.